I've got the warm & fuzzies today. Just see what Linda sent to me from upstate New York. Just the icing on the cake for my laundry room redo. The cherry on top as they say! Isn't this little bib too cute too! I can just see someone lovingly sewing these little scraps together, taking time to arrange them in a pleasing way. Love it. oh yeah. How cute Suzy!!! They are indeed perfect in your laundry room! Sorry I can’t answer why it’s always 6.10, LOL! So vintagey cute! I am loving the way your laundry room looks. Love the bib!! Where did you find that? We always get asked about vintage bibs and I would love to be able to point them somewhere!! My little dresses ended up in my laundry room as well (posted about it), but I didn’t have a spot for the clothesline thing alhto I tried. Mine are pinned to vintage clothespin bags. Great giveaway – we were lucky gals! 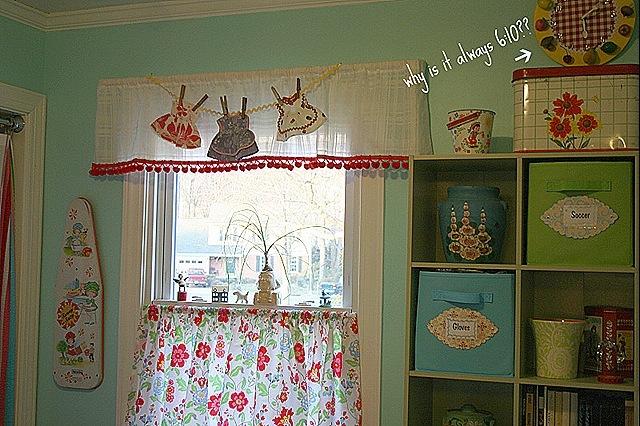 Your laundry room is WAAAAY cuter than mine will ever be! They look great in your laundry room! Looks like they found the right home. I love your laundry room! So cheery it might actually inspire me to do my laundry…mind if I stop by with a few loads? 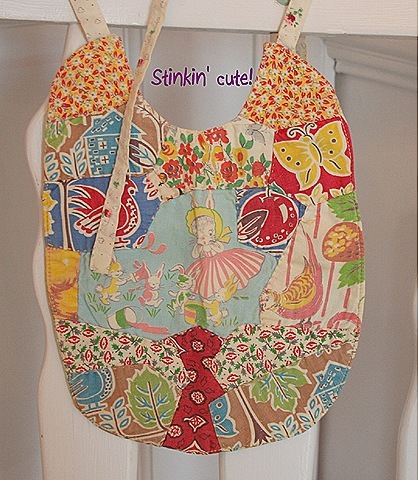 You’re right…the bib is stinkin’ cute!! I thought those dresses might end up in your laundry room. Glad you love them.